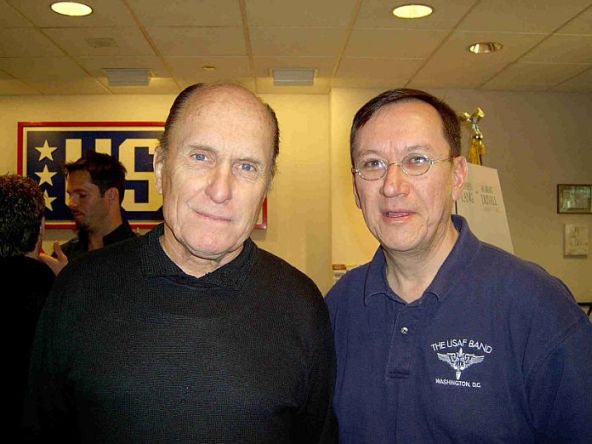 Jari Villanueva was involved with the movie Gods and Generals, which opened nationwide February 21, 2003, and is now available on video and DVD. The screenplay for Gods and Generals was written, produced, and directed by Ron Maxwell. 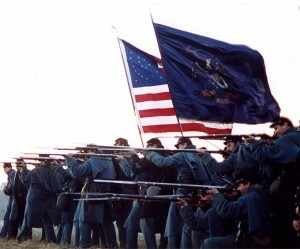 It is based on the novel Gods and Generals by Jeff Shaara, son of Michael Shaara, author of The Killer Angels, upon which the film Gettysburg was based. Gods and Generals is the prequel to The Killer Angels. Gods and Generals was produced by Ted Turner Pictures and was filmed in and around Sharpsburg, Maryland, site of the Antietam battlefield, and on actual historic locations in Virginia and West Virginia. Filming took place between August and December of 2001. The movie stars Robert Duvall as Robert E. Lee, Stephen Lang as ‘Stonewall’ Jackson, Jeff Daniels as Joshua Lawrence Chamberlain, and Mira Sorvino as Fanny Chamberlain. The original score for Gods and Generals was co-written by John Frizzell and Randy Edelman, who also composed the score for Gettysburg. 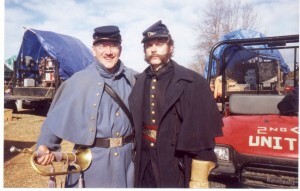 With three other core company reenactors on the set of Gods and Generals. This photograph was made the morning of September 11, 2001, shortly before we heard the news of the attack on the World Trade Center. Photo by Rob Gibson. On Gods and Generals, Jari served as the Assistant to the Music Producer, Mr. David Franco. 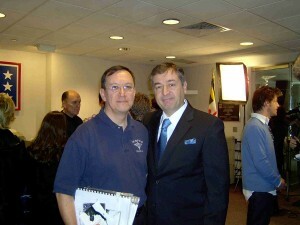 Mr. Franco has over 150 film credits including music supervision and production for Gettysburg. Working closely with Mr. Franco, who is an accomplished violinist and superb musician, Jari was able to observe the inner workings of putting music together for a Hollywood movie. 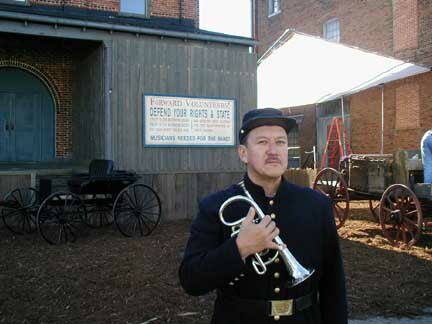 Mr. Franco is responsible for packaging and supervising all music that is heard in Gods and Generals and relied on Jari’s knowledge of military music, bugle skills and experience as a Civil War re-enactor to ensure that the correct music was performed. On the set with Music Producer David Franco (r) and members of the 28th Pennsylvania band. Jari is seated center. Jari’s work on the film included sounding bugle calls and helping to ensure the bugle signals used in the movie accurately match the action taking place on screen. In addition to appearing in the film as a bugler, Jari coordinated the field musicians involved in many on-camera scenes that called for music and assured that the music they played was historically correct. Jari lined up a brass band from the Philadelphia area, fifers and drummers from the Maryland area, singers from Morgan State University and even a pianist from The Peabody Conservatory who was used as a double for Mira Sorvino’s hands. 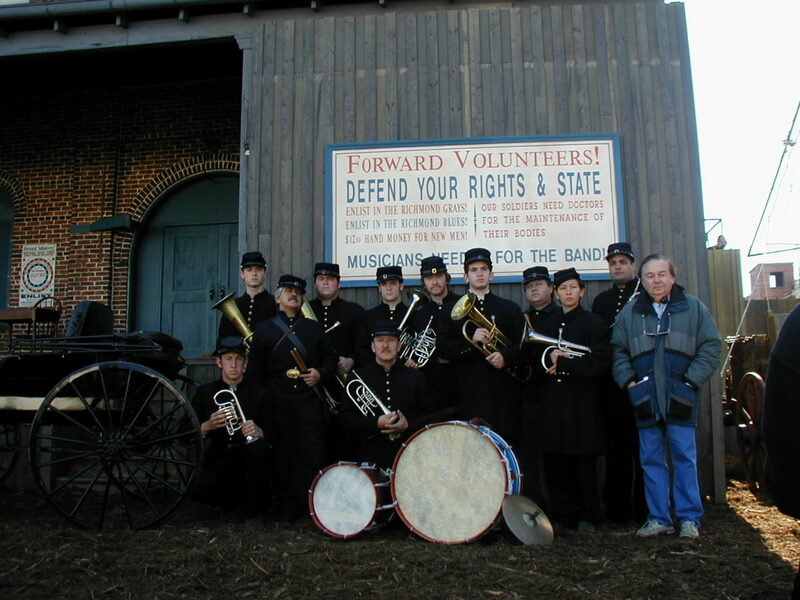 For the movie, Jari arranged a tune for the brass band (I’m Going Home to Dixie), a spiritual for the singers (Steal Away to Jesus), and a marching tune (Cheer, Boys, Cheer) for Confederate troops to sing, all in historically correct styles. 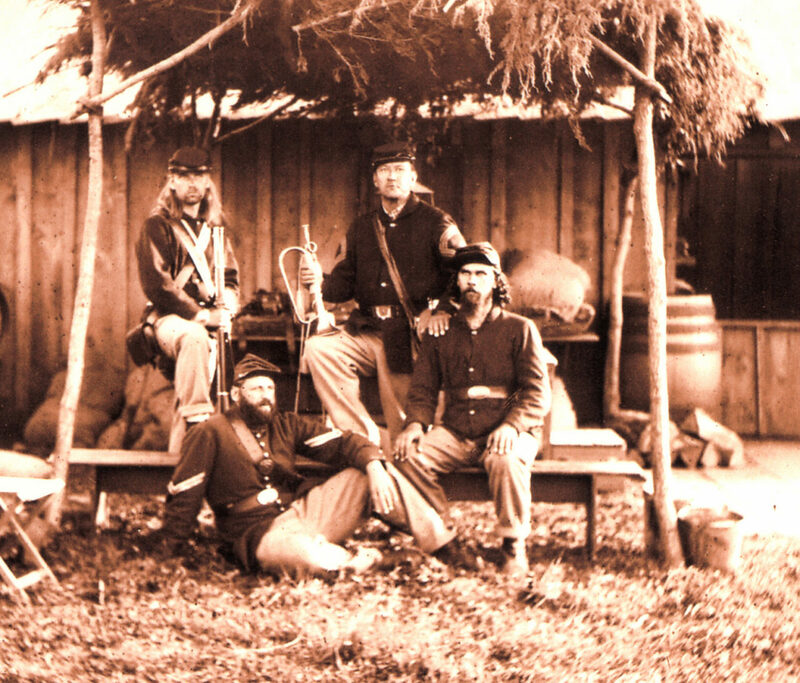 Along with Mr. Franco, he arranged a fife and drum tune, Upon the Heights of Alma, which was originally a Crimean War melody and was employed by the Irish Brigade at the Battle of Fredericksburg in 1862. This entry was posted on Monday, May 31st, 2010 at 5:03 pm	and is filed under News. You can follow any responses to this entry through the RSS 2.0 feed. Responses are currently closed, but you can trackback from your own site.